Building on the features of the Scarlett OctoPre, Scarlett OctoPre Dynamic brings you the ultimate Scarlett expansion with eight Scarlett 2nd Generation mic preamps with analogue compression on every input channel providing a musical, soft-knee style of compression for more subtle control of dynamics. The "More" button then allows you to double the ratio for more aggressive compression effects. Eight channels of Focusrite precision A-D will capture your performance with clarity, honesty and transparency and providing you have an ADAT output on your interface, eight channels of D-A get it back out again via the balanced line outputs. 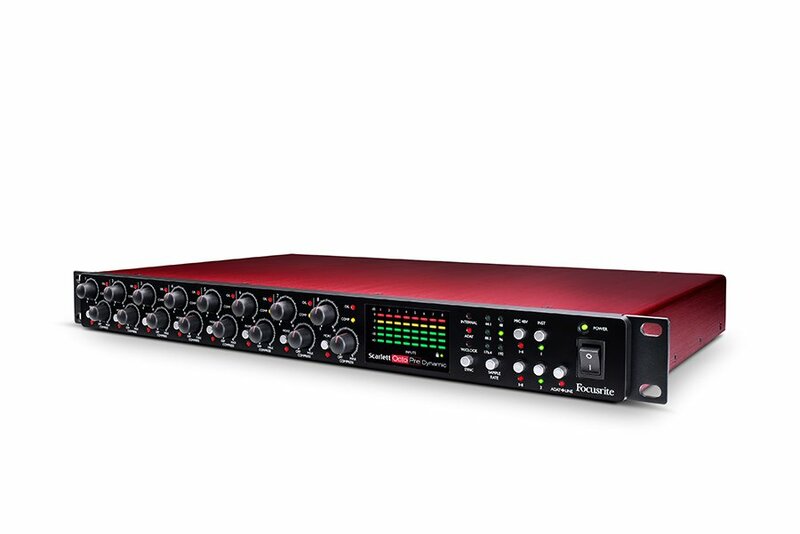 With dual ADAT optical inputs and outputs, it's ideal for expanding your studio's I/O. ADAT is a simple and easy way of bringing extra channels of I/O to your system via optical cable. One light-pipe can carry up to eight channels of audio. Just connect the ADAT output on the OctoPre to the ADAT input on your interface, set your sample rate and clock source and you're ready to go. ADAT I/O is available on many Focusrite and third-party interfaces.